The Mad River, and in particular, this pool, was an area I would return to numerous times in the future to photograph. The 2005 Vermont experience with Rich shocked me. Sure, I had not been there in many years, but my memories were of a 3-4 week “wonderland” of foliage and color everywhere you looked. As we saw, that was not to happen in 2005. The week we were there at the end of September produced an awful lot of green foliage (still pretty, but not according to the plan). We left, thinking we should have waited a week as we began to see some promise of color toward the end of our visit. But the following week, it rained in torrents pretty much all week and essentially took the leaves down with no color that year. The Waterville Mountain Road goes from my “home base” of Bakersfield, over the mountain to Waterville. In years past it was colorful. You can see the lack of maple leaves, with one small suggestion of the reds in the upper right. Wanting to restore my faith, I determined to return in 2006. Rich had other obligations, so I set off on my own. I flew into Burlington, rented a car, and began another week long adventure (again, making the farm in Bakersfield my primary base of operation, though this time I did book a couple nights in a motel in the middle of the state). It turns out, this would be a time for me to explore and solidify my notes for what I eventually would decide would be my first foray into writing and publishing, The Vermont E-Book. The opening image was a find on a rainy morning near my Montpelier Motel. I was driving down Route 100 scouting, looking for color. Any color – anywhere. While this wasn’t the color I was looking for, the Mad River, and this particular pool was an area I would return to numerous times in the future to photograph. My thinking was that if I went a week later, I had a better chance of finding color somewhere – even though I might miss it in the northern parts of the State. Once again, I was mostly stymied. A combination of a more normal, early fall, and a leaf mold disease afflicting Vermont’s Maple trees, created early leaf drop from the Maples. While birch, beach, oaks and ash trees are colorful, it is the Maples that create the brilliant reds and oranges that make New England so colorful in the Fall. Instead, there were the muted colors of the other species, amidst lots of “sticks” (branches). Again, disappointed, I set out to make the most of it. The Waterville Mountain Road goes from my “home base” of Bakersfield, over the mountain to Waterville. In years past it was colorful. You can see the lack of maples, with one small suggestion of the reds in the upper right. In a way, less than spectacular conditions probably contribute to “growth” in a photographer’s craft. It makes us really look at the scenes and the images we produce and requires a much more disciplined focus on composition (we should be doing that at all times, but sometimes “good stuff” in front you makes you lazy). The Trapp Farm image was made in a part of Vermont that I was pretty familiar with. Just a few miles from where I lived for several years in the 1970’s, Stowe, in addition to being a ski and tennis resort, has become a very popular tourist destination. This image was made from near the front lawn of the Trapp Family Lodge. Few among us are not familiar with the musical, The Sound of Music, a musical based on the story of the Von Trapp family’s escape during the Hitler regime. Coming to, and touring in America, the family eventually settled here and who can blame them. You can see the massive leaf drop in the high mountains, but there is still enough low color to make this image pop a little bit. The color never got much better, but I spent most of the week, driving around the state, looking for color and scouting some of the “iconic” locations I knew about. My most successful side-trip was to West Barnett, where I knew there was the potential of an image of Hillside Acres Farm. I found it and was rewarded with some remaining color and nice light. The John Deere tractor spewing black smoke was an added stroke of luck. Still, one can only imagine the big Maple in front of the white house when in full foliage. West Barnett is in the Peacham vicinity, so of course, I stopped back in Peacham to look at that scene. I made a number of images, but couldn’t really improve upon the 2005 shot. So I moved on to East Orange. In 2005, the foliage had grown so full in front of the village up on the hillside, that there was really no shot. The irony in 2006 was that the substantial leaf drop created some “looks” through the new growth that were not there a year before. I liked this image of the Village of East Orange in spite of the lack of colorful foliage in the background. There is a great amount of detail in all the parts of the image. Someone else who must have been there right around the same time period must have liked it alot, too. A few years later, I got an e-mail from someone who had seen my image and felt compelled to write to me to tell me he hope I had been well paid for the image, which was on the Wallmart branded tissue boxes that fall. I did some research and found that the image was on boxes being retail marketed in Wallmart stores on the East Coast. My heart skipped a beat when I saw the box. The image was so close to mine that the shooter could have been standing in my footprints. I did see just enough variation, though, to satisfy myself that the image was not mine. :-). Two other iconic scenes are nearby. One is East Corinth. It is down the road from East Orange and the Waits River Village, and then just slightly East. I visited East Corinth that evening and found the field where the image could be made, just at the tree line above the village. The next morning I was there at dawn, but unfortunately, there was a heavy fog and the recurring theme; significant leaf drop. I made a few images anyway, and this one gives the viewer the idea of the potential if made before the leaves in the background hillside have dropped. What is also pretty obvious from this, the East Orange, and the East Topsham shot below, is that these images are probably no longer viable because of the heavy growth of new foliage obscuring them from the shooters vantage point. East Corinth may continue to provide some views, but it is a bit cluttered as a photographic subject. Just up the road to the North of East Corinth is East Topsham. Another Arnold J. Kaplan iconic shot, this village, too has enough new growth foliage in the foreground to render attempts to photograph it futile. When I returned there a few years later, not only was this shot completely blocked, but the owner of the building to the right of the church had put a new, bright reddish-purple metal roof on. I headed down to the Woodstock area to scout Cloudland Road and another Kaplan Icon, Sleepy Hollow Farm. I found it, but didn’t make an image I was happy with. Cloudland Road is pretty magical, but better when there is good foliage. On the way there, though, I found a shot that I don’t believe was in Arnold’s book. I wanted a shot of the Tunbridge Fairgrounds. A local in the village told me about a road above the cemetery and I drove up and found a shot from a pasture. Sadly, I could see even then, that new growth would soon obscure this already marginal “long view” photograph. Near the end of my trip, I visited the Vermont State Forest area called “New Discovery State Forest.” State Forest Highway 232 goes roughly north and south through the forest, which seems to have pretty good color every year. One of the best parts of this forest is the Owl’s Head Overlook. The negative is that it is not open for sunrise or sunset, however. I was up there during the middle of the day and the light could have been pretty harsh. It was an overcast day though, with sun peaking in and out of the clouds, so I made a couple images I like. Vermont wasn’t the only shooting I did in 2006, but it was the major part of it. I could see a pattern developing where I would travel and shoot, and then not shoot much in between. Earlier in the year, though, I did make it out a few mornings to my local Shiawassee Wildlife Refuge. Among other images, I was able to capture the very skittish Wood Duck from a blind. I don’t think I would ever have gotten this shot if he had the slightest inkling that I was there. This was made with a 300mm lens and a 2x converter. 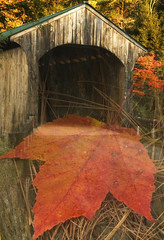 Your photography does Vermont justice…great shots. Hi Tim. Thanks for your comments and for reading the blog! That image in the blog is from the top of Owl’s Head. Yes, its 15 mins max, and I have done it several times. It it not a strenuous hike for most people, though it is a fairly steep climb. There is about a mile drive up first, though, to the parking lot and my disappointment has been that the gates do not open early enough for a sunrise shot or stay open late enough for a sunset shot. Some day I might just hike the whole thing. Are you headed for Vermont this fall?